Today I'm going to discuss a very helpful trick of ratio and proportion of Quantitative Aptitude section. I'm sure this would be very helpful for you and this trick will save your more than half time, you generally take to solve the question. Ratio is written as 2:3, where 2 and 3 are known as terms. First term i.e. 2 is known as Antecedent. Second term i.e. 3 is known as Consequent. `2^2`: `3^2` is known as duplicate ratio of 2:3. `2^3`:`3^3` is known as triplicate ratio of 2:3. `sqrt2`: `sqrt3` is sub-duplicate ratio of 2:3. 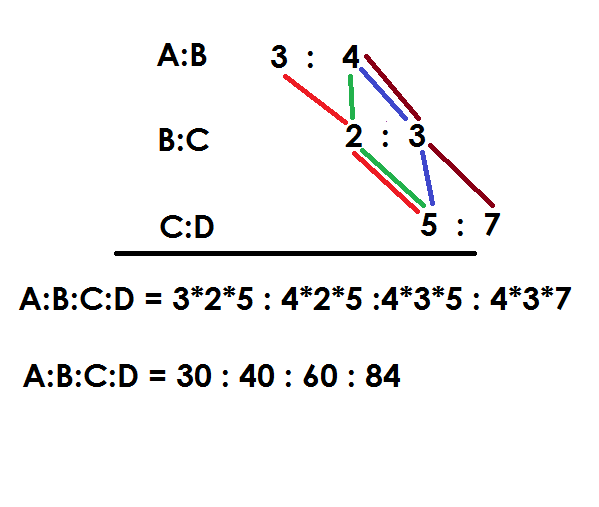 `a^(1/3)` : `b^(1/3)` is sub-triplicate ratio of 2:3. Example: If A:B = 3: 4, B: C = 2: 3 and C:D = 5:7, then find A:B:C:D.
Solution: General method of solving this question is very lengthy, So let me tell me tell you how can we calculate it easily. See how it is simple, you just need to remember the pattern and if you notice it, it is really simple . Last and first steps are just the straight lines. So, what is left, just the middle pattern. Example: If A: B = 3: 4, B: C = 4: 5, C: D = 1: 2 and D: E = 3: 4, Find A: B: C: D: E.
Take a pen and try to make it yourself first or do it step by step by looking the solution. then only you can learn this technique. So, this is how we solve these types of questions quickly. I will update one more session of this chapter regarding proportions.